1963 – God placed it on the heart of a number of people in Red Deer to begin a new work of the Holy Spirit among us. Willard Swalm moved to Red Deer to lead this new work under the guidance of the Holy Spirit. 1963-1965 – God provided the funds ($9,545) required to purchase a large lot in Oriole Park, encouraging us all and allowing us to continue praying and planning. 1966 –God called Bill Annett to Red Deer to carry on the leadership of the church. Bill would often stand on the purchased lot in Oriole Park in the tall grass and weeds up to his knees and he would pray for a church that would reach out to Red Deer and bring people to Christ. 1967 –God was faithful and in the fall of this year we broke ground for the new church building. 1968 –On Easter Sunday we met for the first time in the new church that God provided for us. 1972 – The church doubled in size over the first few years and by 1972 there were 100 people attending regularly. Many lives were being changed through the power of the Holy Spirit. 1976 –February 29th was a day of celebration and giving “Glory to God” for His help and provisions as we were able to pay off the building debt. 1977 –It became clear that the existing facility was not going to handle all that God was doing in our midst and so it seemed good to us and the Holy Spirit to expand the building in the current location. We planned for triple the current capacity. 1978 –In the spring the construction began on the new phase. 1983 – The debt was totally retired within three years and the expanded church served the continued growth well. 1985 –Pews were added in the balcony and we began running two services to accommodate the growth. 1986 –We celebrated God’s faithfulness to His church and together we burned the mortgage having paid it off in full. 1983-1987 –The church grew to over 350 and in 1987 God called Glenn Fretz to Oriole Park. 1988 –Twenty five couples were asked to leave Oriole Park Church to begin New Hope Missionary Church on the other side of Red Deer. We blessed them and prayed for them as they went. 1995 – God spoke through Glenn Fretz and gave the church a vision for the future. The congregation together discussed a number of options to accommodate growth and agreed unanimously to “stay together and grow together”. 1987-1996 –Lives were being changed by the power of our God and the church grew to over 450. 1997 –A meeting with our neighbours was held to discuss a new phase on our existing property and God made it clear to all of us, through our neighbours, that we were to move rather than continue growing in the current location. God called Dan Cochrane to Red Deer as the one to provide leadership over a new chapter in the life of the church. God made His heart known to us this year in a very special way and He gave us a clear vision for His church -- to give everyone in central Alberta an opportunity to have a personal relationship with Jesus Christ. 1998 –The Church Board formed a relocation committee and a building committee because the church began to grow significantly because of the clear vision God had given to us. 1999 –Prompted by the Holy Spirit, we entered discussions with New Hope Church and together decided to merge to focus our efforts together on reaching Central Alberta. 2000 –Our church had grown to over 700. On December 3rd the vision of a building project was cast. The congregation was asked to embark on an exciting project which would include relocating and building a facility for at least 1,000 people. 2001-The Lord blessed us with a 21-acre location that was a perfect picture of God’s heart for Red Deer and all of Central Alberta. In October we held our very first service on the unprepared site. There were over 600 of us there, praising and worshiping God. The congregation voted and approved the $6.7 million building project. 2002 –Red Deer County passed 2nd and 3rd readings for rezoning the property in a single meeting. In June we celebrated together what God would do among us by giving to Him our gifts and offerings which came to over $800,000 from over 265 families. The church grew to over 900 plus our children. On September 15th we celebrated once more and turned the sod on God’s land that He had given to us to work. That day would see over 900 come and write on survey stakes the names of their friends and families whose lives had not yet been given over to Christ. Together, we believed that God would grant us our prayers for all 1,445 names that were counted that day. 2003 –We incorporated as a legal society and moved to a governance model to provide the administrative support required to support the coming infrastructures of a larger church. On December 14th the first service was held in the new building with over 1,400 in attendance. 2004 –The building was completed with an outstanding debt of 2.2 million. An amazing gift from God, reaffirming His faithfulness to us, He presented us with an interest free loan for this amount. 2006 –On October 31st the interest free loan was paid in full and celebrated on November 5th. God challenged us through his servant Dan Cochrane that He had even greater things in store for us and He reminded us that there are still thousands of people in Central Alberta that had not yet heard of His love for them. 2004-2007 –Throughout this time there were conversions and baptisms and lives being changed by the power of our God. And the church grew to over 1,800. His faithful love endures forever! 2007 –After much prayer and seeking God's heart, we updated our vision statement by adding two key directives to the end of the original statement. It now reads "Our vision is to give everyone in Central Alberta and opportunity to have a personal relationship with Jesus and by following Him, compassionately impact our world." 2008 –In January we committed to impacting our world through a major global compassion effort that would give $3 million over the next six years to go directly toward this effort. Its primary focus would be to provide relief and long term sustainable change for the eradication of the AIDS pandemic in Africa and other locations around our world. A committee was commissioned and proceeded with the search for such projects. 2008 –In March we committed to a building expansion project to allow for continued growth as we dedicate ourselves to giving life to our community through the power of the Holy Spirit. Our Give|Life campaign was started and people engaged in being part of God's story here at CrossRoads Church and Central Alberta. 2010 –In June our building expansion began to add 30,000 square feet of space for our kids ministry, kitchen and chapel. 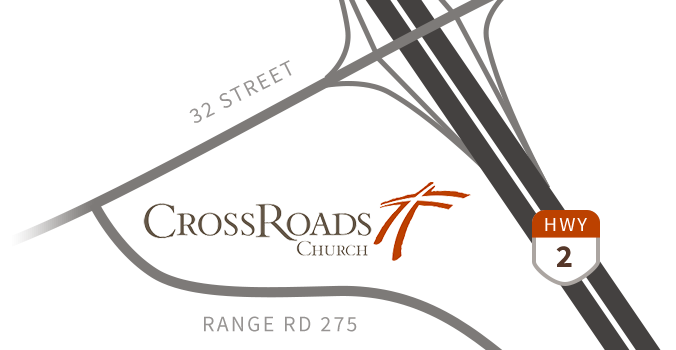 God's faithfulness keeps bringing families to CrossRoads and we need the space to hold them! 2011 –In September we celebrated the grand opening of our expansion in true Children's Ministry fashion: lots of food, games, bounce houses and confetti! On December 28 we mourned the loss of Bill Annett, our senior pastor from 1966-1972. 2014 –On Thanksgiving weekend we celebrated the grand opening of the Youth Centre. This has provided a place for outreach to youth in our community as well as a place for those within our own church body to grow in their faith.